It’s time for a slots party! Getting dark? It’s time for you to put on your dancing shoes and to head over to the club. 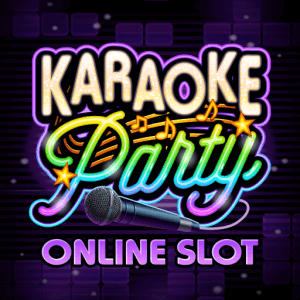 Warm up your voice and get down with Karaoke Party and belt out those tunes while you play for a huge jackpot amount. Our double party slot bonanza is waiting for you to enjoy with two slots packed full of bonus features and more ways to win than you can imagine. The 5 reel, 243 ways to win video slot is packed with all the glitz and glamour you would expect. And, a list of bonus featureswill keep your feet tapping all night long. The Karaoke Party logo Wild symbol will serve as a substitute for any symbol. The Wilds assist with completing winning combinations and supercharging potential wins. All wins including a Wild symbol will be awarded a 2x multiplier. Three or more dice Scatter symbols on the reels will unlock 15 Free Spins with a 3x multiplier. With this feature you will have a chance to hit the slot’s maximum jackpot. After each win, a player can select to Gamble their winnings. With this nice feature players have possibility of doubling or even quadrupling their original winning amount. In addition, Karaoke Party offers players the chance to play for the slot’s impressive 150,000 coin jackpot, motivation enough to give this one a few spins. Let’s sing a song and win some money! Your ticket to our exclusive slots party awaits. Start playing and party the night away in the comfort of your own home. In order to play the game for free you can use our Free Spins Microgaming list and claim exclusive bonuses. For example, we can recommend playing 7Sultans Casino where you can get 100% match bonus and some free spins after registration. Will you try it now?